A Nuclear Power Plant has many components that work together to produce electricity. These components consist of fuel rods, control rods, a coolant, a steam generator, a steam line, a turbine, a cooling tower, and of course the electricity generator. Nuclear power is continuously produced in a cyclic process. To begin, start with the first step, fueling the reactor itself. Fuel is supplied by the fuel rods that are strategically placed within the moderator filled reactor, sort of resembling a cup filled with straws. Heat and energy are given off by these rods during nuclear fission; this heat causes the water to expand as steam to be used later in the turbine. The heat given off is controlled by control rods. 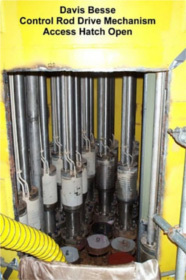 Control rods are lowered in to the reactor in predetermined reserved spaces; the purpose for control rods is to absorb the radioactive particles surrounding the fuel rods. 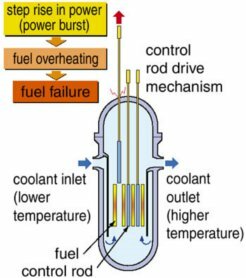 With control rods, nuclear plant operators are able to manage heat by lowering rods to lower heat-to shut down if lowered completely- ,or higher rods to raise the heat. Another nuclear power plant feature for controlling heat produced is the use of a coolant/moderator. Most of the time this coolant is water, but in other reactors this coolant may take the form of liquid metal or a gas. Like the reactors, control is the top priority, so this coolant is distributed by a sophisticated pump. The chief difference between the control rods and the coolant, is that the coolant is supplied to higher the maximum heat level produced safely by the fuel rods, like the effects of a water cooling system on a over-clocked CPU. The coolant which is heated when in contact with the heat of the reactor flows out of the reactor through a pipe to go under the steam generator. This pipe acts like a heating element does on a pot of water, the steam generator being the pot. When the water is heated it produces steam that is transported through a turbine. As the turbine is turned by the steam, it generates power, this the electricity used in the grid. Eventually the fuel rods and control rods-known to be high level nuclear waste-reach the end of their expected life time and must be transported to a cooling pond to become radioactively stable and later be stored or reprocessed. These rods are then replaced with new rods to once again begin the nuclear power generating cycle. A control rod is a mechanism used in the nuclear chamber to control a nuclear reactor’s output by absorbing free neutrons. Control rods are made of materials that have a natural affinity for absorbing free neutrons, like hafnium and boron. The amount of nuclear fission that is occurring in a reactor is based on the number of free neutrons that are available to cause fission of the nuclear fuel. By introducing or removing the control rods from the nuclear chamber, the amount of free neutrons is controlled which in turn affects the frequency of fission reactions. This control is essential to making sure that the tremendous amount of heat and energy created during the fission reactions does not cause fuel assemblies to become damaged possibly creating a catastrophic failure. In the illustration above on the left you can see that the control rods are injected or retracted from between the fissionable material in order to maintain the ratio of neutrons needed to keep a sustained and controlled rate of fission. If this ratio of neutrons falls the reaction slows down releasing less heat into the coolant and a lower production of energy. On the other hand, increasing the ratio of neutrons will speed up the reaction, releasing a greater amount of heat into the coolant and a higher production of energy. In the actual mechanism shown above on the right, a failsafe occurs if the lifting mechanism malfunctions, due to its vertical arrangement, gravity will naturally pull the control rods down into locations inhibiting further nuclear fission reactions. Through milling, uranium oxide (U308) is converted to uranium hexafluoride (UF6). This separates U-235 from the U-238 nucleus. UF6 is enriched and converted to Uranium Dioxide (UO2) so that it can be used in nuclear fuel. In the United States there is only one conversion plant capable of this type of enriching. Through heating, UF6 powder is processed in pellet form. These pellets end up measuring one centimeter in diameter by 1.5 centimeters thick, after they undergo a grinding process that brings them to uniformity. These now congruently shaped cylinders are stacked by how their specific nuclear core is designed inside tubes that are made of corrosion-resistant metal alloy, to form fuel rods. These rods end up measuring around 1.3 centimeters in diameter and 3.7 meters long. 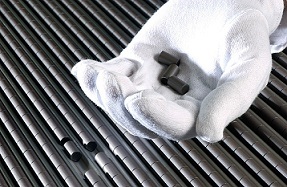 When put together, these rods create assemblies to be used in a power reactor as its nuclear fuel core.